Appendix. How Can I Learn More About Problem-Based Learning? The Problem-Based Learning Network (PBL Net) is one of ASCD's member networks. Our goal is to create a strong base of support for problem-based learning among educators at all levels. Problem-based learning enhances understanding through more relevant, connected learning and taps students' natural curiosity about the world around them to ignite motivation for learning. Students address issues that challenge them to apply what they have learned in authentic ways. PBL Net maintains and supports an interpersonal and electronic network to enable dialogue and the sharing of information, methods, and materials. We strive to enhance our understanding of problem-based learning from the perspectives of learner, coach, and problem designer. Our award-winning newsletter, The Problem Log, connects and inspires our members. Acknowledged experts in PBL submit articles, as do practitioners eager to share classroom experiences. Reflections of teachers in the midst of changing teaching and learning in their classrooms, reports of teachers' action research related to PBL, and dissemination of relevant research about PBL (K–16) round out each issue. Member fees are $15 per year, due on the anniversary of initial membership. Members receive three issues of The Problem Log annually. PBL Net holds an annual meeting and discussion forum scheduled concurrently with the ASCD Annual Conference. For membership information contact: The Center @IMSA, Illinois Mathematics and Science Academy, 1500 W. Sullivan Road, Aurora, IL 60506; or e-mail: pbl-info@imsa.edu; or call 630-907-5956 or 630-907-5957. An electronic mailing list (IMSACPBL-L) facilitates online dialogue among those interested and working in problem-based learning. The Illinois Mathematics and Science Academy maintains this list, which is made possible through additional funding provided by The Hitachi Foundation. The Center@IMSA also moderates a threaded discussion forum on ASCD's WWW site:http://www.ascd.org/forums.html. 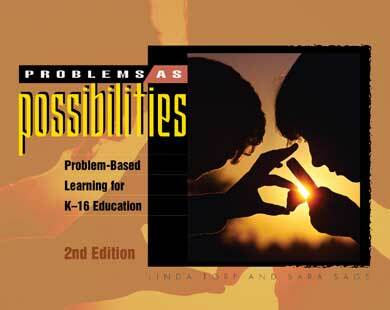 Click on ASCD Network: Problem-Based Learning. Add your thoughts and comments to the ongoing discussion. The Carnegie Foundation site gives a description of a teacher education problem. What is the Center for Problem-Based Learning? What does PBL look like in the classroom? Who can I contact to learn more? The Bison Commons. An interactive WWW-based PBL problem for middle grade and high school students, complete with problem information links and a Teacher Information Center. SUPERLAND! A WWW-based PBL problem used in the Summer AD'Ventures program for middle grade students, complete with individual student products. The Illinois Mathematics and Science Academy (IMSA) is an educational laboratory for designing and testing innovative programs and methods to share with other teachers and schools in Illinois and beyond. Included in the laboratory is a three-year (grades 10–12) residential program for Illinois students talented in mathematics and science. To mentor educators in all disciplines as they design and develop effective problem-based learning materials and become skillful coaches. To explore problem-based learning strategies as the context in which knowledge is acquired, ethical decision making is nurtured, and problem-solving skills are developed. To connect problem-based learning educators through numerous networking options designed to meet a variety of needs. Observation, collection, analysis, and interpretation of data. Cooperative learning and collaboration with experts. Use of mathematics, science, and technology education in an integrated manner. Scientific inquiry and critical consideration of competing hypotheses. Presentation of hypotheses, method, and results. Space sciences and earth system science. Currently under development at the CWT, this will be a CD-ROM-based multimedia approach to the solar system. The project is funded by the National Science Foundation. This Macintosh CD-ROM-based multimedia program provides 9th and 10th grade science classrooms with 10 complete investigations in stellar astronomy. This CD-ROM makes use of 3-D virtual reality technologies and introduces students to NASA research aimed at long-term space habitation. Students work online with 17 Web-based learning modules that address real environmental dilemmas worldwide. This CD-ROM-based multimedia curriculum supplement for grades 7–9 provides an interdisciplinary approach to understanding. This WWW-based curriculum supplement is for students in grades 9–12. The activities immerse students in standards-based mathematics, science, and technology design and construction projects. The Indian Agent Appointment Interview. This scenario places the student in 1873 as an Indian agent for the Comanche Indian reservation. The unit provides selected online links and resources. A prompt initiates the problem. The Indian Reservation Gaming Issue. This scenario is placed in the present. The student takes the role of a newly appointed congressional intern who has received a letter from the his congresswoman asking for help regarding issues about gaming casinos on American Indian reservations. Selected online links and resources help with research.